This has been an interesting October. I am glad the government is up and running again, but I am still baffled by the way things are done in Washington. The shutdown was well timed for my surgery, except that I am still not sure exactly what my status was the entire time. I took two weeks of sick leave for my ankle surgery, but when the shutdown happened, all leave was cancelled for the duration of the shutdown. After a week of furlough as non-essential, we were called to report back to work on Wednesday, October 9th and deemed to be essential. Since I had surgery on Monday, October 7th, I was unable to report back on October 9th. Per my understanding of the shutdown rules, my inability to report left me on continued furlough status. I think in the end this worked to my benefit, but it was pretty stressful knowing there was a chance I wasn’t going to get paid because I couldn’t go to work. I’m just relieved that I no longer have to listen to political ridiculous every single day to stay informed about the current status of my employment, but in general this whole shutdown has been a giant wasteful mess. I was planning on going back to work tomorrow, Friday, October 18, because my foot was feeling better and I was getting around really well. Yesterday was the first day that I didn’t spend the vast majority of my time with my foot elevated. This turned out to be a mistake, because last night my foot and leg started to ache like a tooth. I took a percocet for the first time this week, which didn’t touch the pain at all. For a while I was convinced I had the flu. Regardless, I spent most of the night wide awake, and I realized that it would be a few more days before I was able to sit at a desk for eight hours. Hopefully I can go back to work early next week. I think I’ve overdone it all week, and it’s catching up to me. It is also possible that I started walking in the boot without crutches a tad too quickly. Crutches are a lot of fun for about 45 minutes. Because I have some masochistic qualities, I sort of enjoyed my crutches for about two days. After that, the palms of my hands started to hurt and by the end of the third day I had abandoned them. My post op instructions were – “activity as tolerated” and limping around is more tolerable to me than crutches. I’m a little sorry I’m not sorry, but only because my foot hurts today. Doctors need to be specific and threatening for crutches to be kept in rotation. BUT! In between all this hobbling around, I really have been quite the sloth. The first week all I did was make it downstairs in the morning, post up in my little pillow nest, and fall asleep in the rare moments when I wasn’t eating something. It was difficult to watch a whole tv show or read anything. By the weekend I was more alert, and since then, my Stephen King novel and the DVR have kept me entertained. Kate promised to buy me The Heat on DVD as a special treat today, and I can’t tell you how excited I am about that. Laughter is the best medicine. My ankle is surprisingly not that bruised, and the swelling went down after the first few days. I think the stitches could have come out yesterday, but my appointment is not until Monday, October 21. I have become an ace at wrapping ace bandages, if you ever need a good ankle wrap, I’m your girl. 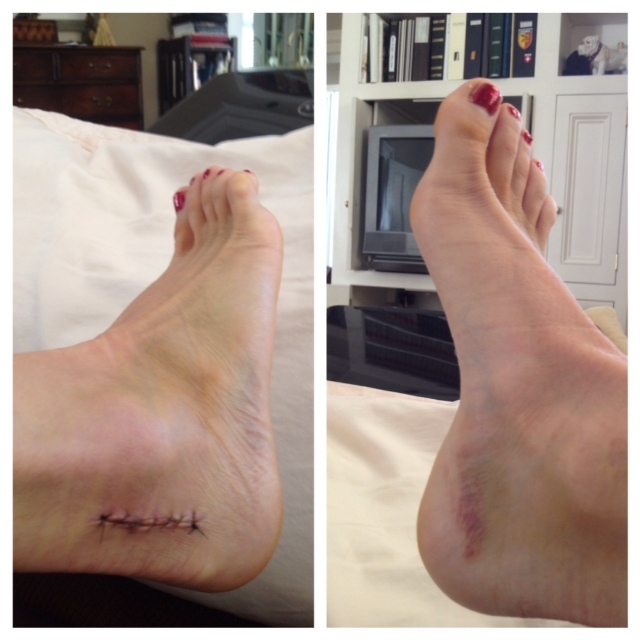 Also, upon reflection, I think I did a pretty hack job of explaining my surgery in my earlier blog post. This blog post is a much better explanation, in case you are curious. Now for the foot photos! I’ve used pic stitch, to show a progression. 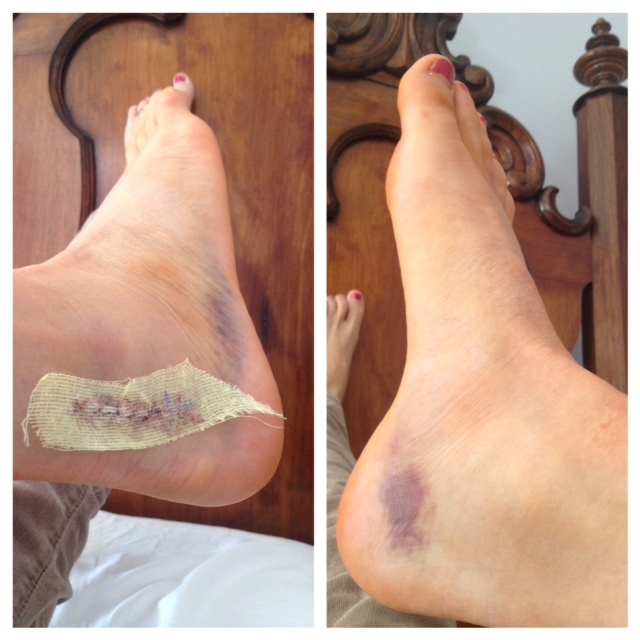 If you hate feet, or stitches, or bruises, feel free to not enjoy the rest of this blog post, but I feel like it could be a lot worse. #1 – toes on day 3, before initial dressing was removed. 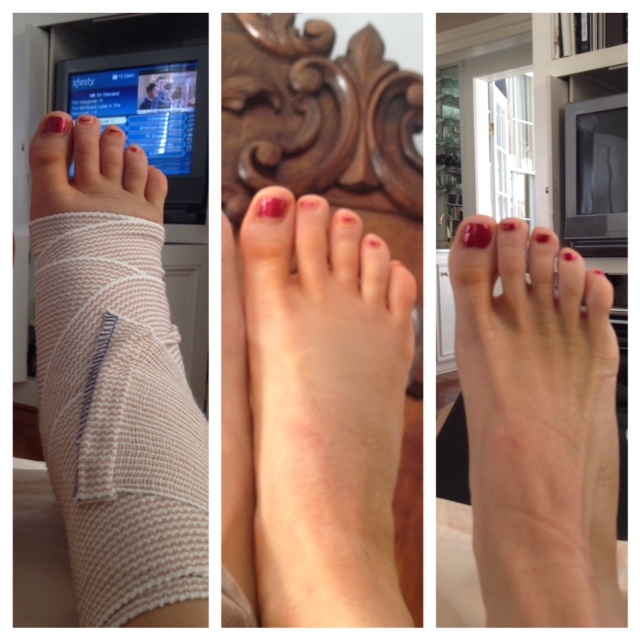 #2 – toes 72 hours post op after initial dressing removal, and #3 – 9 days post op. 72 hours post op, I was allowed to take the dressing off and shower.